Although a variety of foods provide energy-producing carbohydrates, sugar is among the most popular. It’s believed we universally crave sugar because of the quick energy boost after eating it, or that it also causes a release in our brains of serotonin endorphins, chemicals which relax us and make us feel good. But there is a downside to refined sugars like table sugar or high-fructose corn syrup: too much in our diets contributes to conditions like cardiovascular disease, diabetes, and dental disease. On the latter, sugar is a primary food source for oral bacteria; the more sugar available in the mouth the higher the levels of bacteria that lead to tooth decay and gum disease. Moderating your intake of refined sugars and other carbohydrates can be hard to do, given that many processed foods contain various forms of refined sugar. A diet rich in fresh fruits and vegetables helps control sugar intake as well as contribute to overall health. Many people also turn to a variety of sugar substitutes: one study found roughly 85% of Americans use some form of it in place of sugar. They’re also being added to many processed foods: unless you’re checking ingredients labels, you may be consuming them unknowingly. 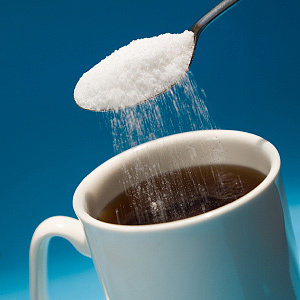 Sugar substitutes are generally either artificial, manufactured products like saccharin or aspartame or extractions from natural substances like stevia or sorbitol. The good news concerning your teeth and gums is that all the major sugar substitutes don’t encourage bacterial growth. Still, while they’re generally safe for consumption, each has varying properties and may have side-effects for certain people. For example, people with phenylketonuria, a rare genetic condition, can’t process aspartame properly and should avoid it. One alcohol-based sweetener in particular is of interest in oral care. A number of studies indicate xylitol may actually inhibit bacterial growth and thus reduce the risk of tooth decay. You can find xylitol in a variety of gum and mint products. When considering what sugar substitutes to use, be sure you’re up to date on their potential health effects for certain individuals, as well as check the ingredients labels of processed foods for added sweeteners. As your dentist, we’ll also be glad to advise you on strategies to reduce sugar in your diet and promote better dental health.